The South Korean government should rethink its current approach to radioactive waste treatment technologies before attempting to go nuclear free, a renowned American nuclear expert said. 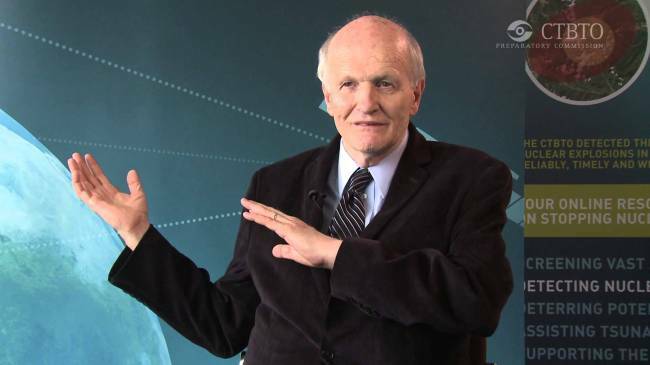 In an interview with The Korea Herald, Frank von Hippel, a professor at Princeton University, warned that the state-run Korea Atomic Energy Research Institute is working on technologies that have failed in all other advanced industrial countries. With liberal President Moon Jae-in -- an advocate of nuclear-zero Korea -- taking office, the new administration has unveiled a roadmap to phase out nuclear power plants over the next 40 years. At present, 25 reactors are in service and the Moon administration aims to begin with shutting down older facilities. “It is feasible for South Korea to close down all of the nuclear power plants. The US dismantled nuclear power plants, older than ones (still in use) in Korea,” Hippel said. According to the expert, in order to dismantle nuclear reactors, a thorough review of pyroprocessing technology researched by KAERI should come first. Pyroprocessing, one of the technologies used for reprocessing spent nuclear fuel and liquid sodium-cooled reactors, was once touted as an effective method to reduce the volume of waste. But many experts, including Hippel, say the method can complicate waste disposal by creating different types of radioactive waste. “They also remain extraordinarily expensive. KAERI’s scheme would saddle the country with a hugely costly, dangerous and futile nuclear enterprise,” Hippel said. He also pointed to the global trend of abandoning radioactive waste reprocessing for sodium-cooled reactors. Due to cost issues and environmental risks, many countries are moving away from what Korea is using at the moment, he said. His study states that six out of 31 countries with nuclear power reactors use the reprocessing method. More than $100 billion has been spent worldwide on failed attempts to commercialize sodium-cooled reactors, which have proven to be unreliable and costly. As an alternative, he suggests storing spent fuel in dry casks. While KAERI argues that Korea is too small for a spent fuel repository, the area of repository for spent fuel is in fact equivalent to the amount of spent nuclear fuel accumulated from light water reactors, he stressed. As an example, he referred to Wolseong NPP, which holds about 7,000 tons of dry spent fuel storage capacity. Such a large capacity can help make storing spent fuel safer and less costly, as burying the waste 500 meters below ground is safer than surface storage, he said.